Russia Today: When archaeologists made their way through a 4,500-year-old necropolis and found an extraordinarily rare collection of mummified cats and beetles, they could hardly imagine their exploration would lead on to something even bigger. On Saturday, a team of explorers crept through walls dating back to about 2,500 BC and unearthed a collection of cat mummies and scarab beetles as they scavenged through the Sarraq necropolis on the edge of the King Userkaf pyramid complex. Two scarab beetles were found in a limestone sarcophagus with a vaulted, decorated lid, the antiquities minister said in a statement. “The [mummified] scarab is something really unique. It is something really a bit rare,” said Mostafa Waziri, secretary-general of Egypt’s Supreme Council of Antiquities. Another collection of the large beetles – black insects considered sacred in ancient Egypt – was found inside a smaller sarcophagus. Besides the sacred beetles, the archeologists also found dozens of mummified cats, animals that were revered in ancient Egypt for killing snakes and protecting pharaohs. 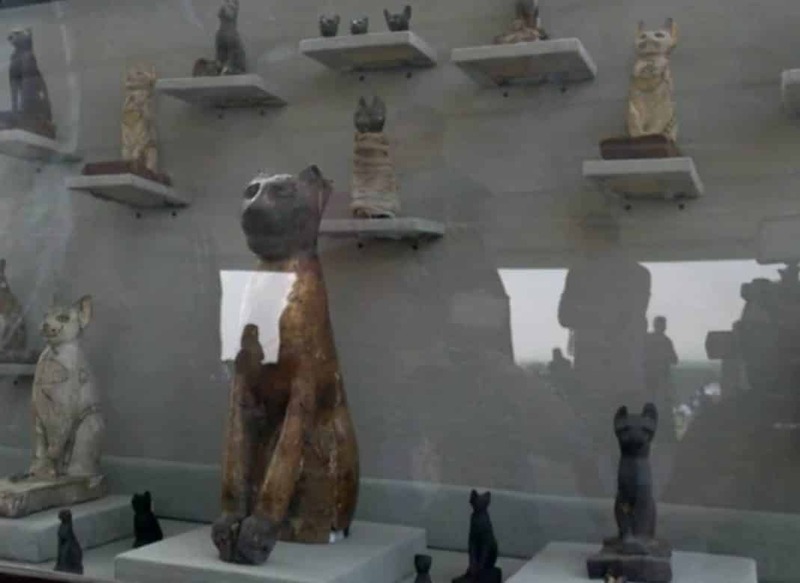 Gilded statues, including a bronze one dedicated to the cat goddess Bastet, were also among the buried treasures dug up at the complex. However, the ancient complex had even more in store for the explorers. As they prepared the site to exhibit the new discoveries, they ended up stumbling across the door of another tomb which appears to have never been touched before. According to Waziri, the fact that the tomb’s facade and doors are intact suggests its contents may still be in the condition in which they were originally preserved. The team intend to explore inside in the coming weeks. Previous articleNEO: Do Loan Sharks Run America? The burning of the Library of Alexandria was the crime of the ages. All three judaic religions had a hand in it. If the Vatikan were to be overthrown and the entire lot tossed out on their ear, what would we find hidden within those corrupt old walls? Yes, and adding insult to injury, they took the information and changed it to their liking to support territorial expansion. They literally stole history and replaced it. The shrug, is now the answer too all deeper questions.